One of my favorite parts of visiting my family is sitting around the dinner table enjoying a meal together. There is something so great about catching up with everybody over a delicious meal, like this tasty root beer pulled pork. But one of the things I never realized about sitting around that table, is that every single person has an entirely different way of eating. Some of my family members eat quickly, while others eat slowly. Some put a bite of everything on their fork at the same time, while some don't let their food touch at all. It never dawned on me that our distinct eating habits can actually speak volumes about our personalities, just like with our driving habits. And when I saw what my eating habits say about me, I was surprised by how spot on it was. Scroll through below to find what kind of eater you are and what that reveals about your personality. Were your results as accurate as mine? Let us know in the comments! 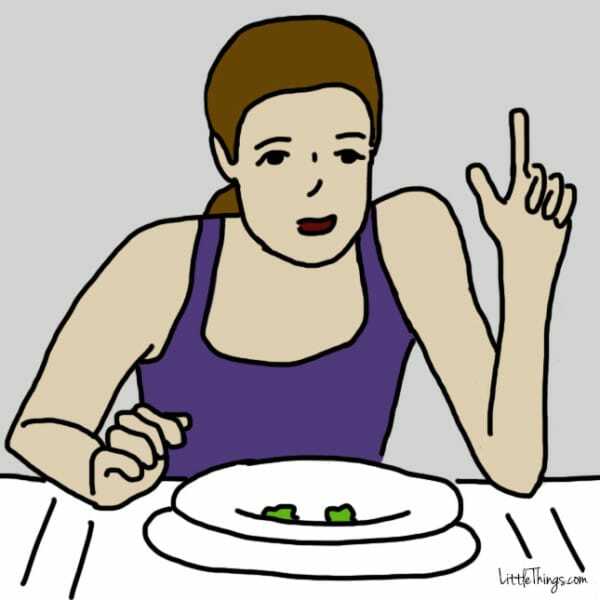 If you are The Slow Eater, you are the type of person who truly takes your time enjoying a meal, and is in no rush to finish. You like to make the most out of every moment of life. At work, you are in no hurry to get things done. You believe a job well done is better than a job quickly done. In relationships, you are always living in the present moment. This may make fights all the more intense, but it may also make the good times all the more enjoyable. Your seeming lack of an inner clock may get on other people's nerves. But don't let this deter you from being yourself. Keep enjoying each moment; just be careful not to let life speed by you in the meantime. 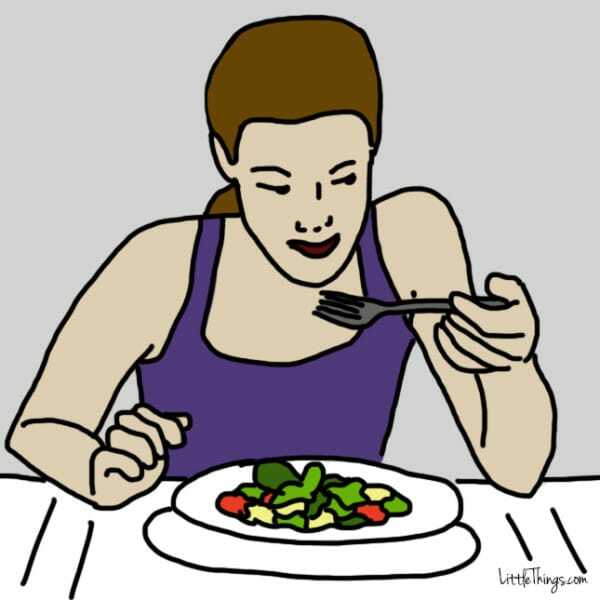 If you are The Fast Eater, you are the type of person who gets through a meal as quickly as possible, oftentimes not even taking time to chew the food completely. You are really great at getting things done before a deadline. Your bosses at work love this about you. You are good at multi-tasking, have a healthy sense of competition, and your brain is often ten steps ahead of your current position. In relationships, you often put the needs of others ahead of your own, and your considerate nature makes you an extreme catch. However, rushing through things like meals implies that you don't take enough time for yourself. Make sure to create enough space in your life for your own needs. And be careful not to rush through the good times; you may just want to slow down a bit and enjoy them. If you are The Organizer, you are the type of person who doesn't want any of your foods to touch each other. You like to keep things neat and tidy, and you avoid messy situations at all costs. At work, your organizational skills help you to keep track of the tasks at hand, as well as any that may be coming your way. At home, you may struggle with having to always be the one to do the dishes or the cleaning. But if you are able to strike a compromise, you are the perfect person to organize a house schedule to share the responsibilities. Be careful that your list-making brain doesn't allow you to get too stressed out when things go off track. Learning to be flexible will only complement your already enviable tidy lifestyle. If you are The Adventurer, you are the type of person who always wants to try new and exotic types of food. You will never be accused of being boring. You like to take risks, and quite often they pay off in a big way. At work, you are not afraid to propose a bold new idea. And your adventurous spirit makes you someone that everyone wants to be friends with. People admire your bravery and seek to be more outgoing like you. Your one-of-a-kind approach to life is something that you should never change. Just be careful not to pressure others to be as adventurous as you; not everyone is meant to be an explorer. If you are The Isolationist, you are the type of person who only eats one type of food at a time. 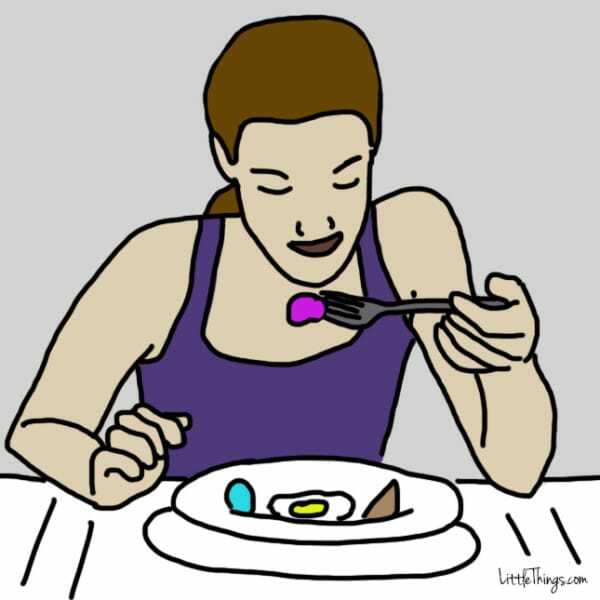 You will be sure to finish each kind of food before moving on to the next. You are a very detail-oriented person, and you are sure to always think things through thoroughly. Though other people may not always understand your way of doing things, deep down you know that there is a method to your so-called madness. You are a very careful person, often gaining you praise at work for your attention to the most minute details. Be careful not to alienate others by being too rigid about things. Even though you see a proper way to proceed, not everyone always sees it that way. Try to have patience and flexibility to even further strengthen your relationships. If you are The Mixer, you are the type of person who mixes all of your food together, and gets a little of everything in every bite. You are a strong person, and you feel that you are capable of taking on a lot. At work, your bosses love that you are willing to take on so much responsibility. And as an outgoing and friendly person, you have healthy relationships where you aren't afraid to make time for all of the important people in your life. That said, you can sometimes over-commit. It may be hard for you to know which task to tackle first. Practice prioritization and you may just find that your hard work in life pays off greatly. If you are The Oversharer, you are the type of person who likes to slurp your soup, and chew your food loudly and proudly. You have a carefree spirit, and you don't overly worry about what other people think about you. You march to the beat of your own drum, which is a quality that many people admire about you. You aren't afraid to show the world who you are, and you aren't afraid to let people know exactly what you want. Your straightforward and open approach may be off-putting to some people. 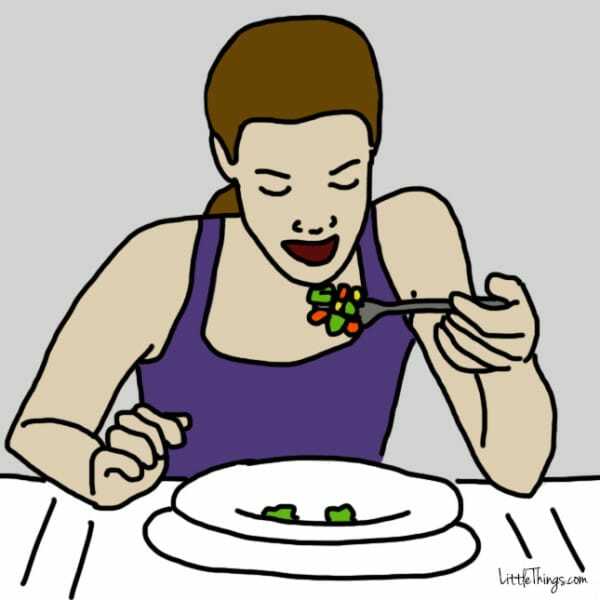 And there might be certain situations where eating with your mouth closed will get you further. But don't let anyone talk you into changing; continue to march to that drum, even if you are the only one who hears it. 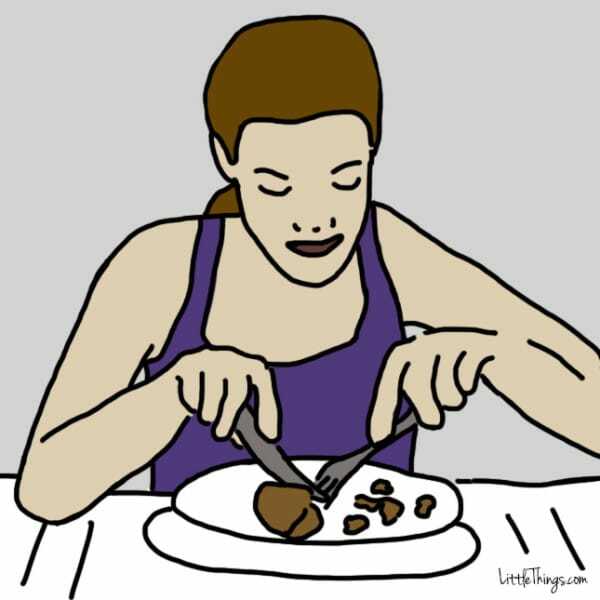 If you are The Preparer, you are the type of person who cuts all of your food into manageable bites before you start eating. You are the epitome of a forward-thinker. You are always considering how one move will lead to another. At work, you are constantly dreaming big and working hard to move up the ladder. In relationships, you like to make dates well in advance, and you are always on the lookout for a mate with big long-term goals. Be careful that your planning doesn't keep you from enjoying the present moment. Take time to enjoy where you are right now. Your future planning will pay off much more if you enjoy yourself every step of the way. If you are The Picky Eater, you have a lot of very specific requests for your food. When dining out, you have plenty of questions and specifications for the server. You are someone who thrives when you are in your comfort zone. You like that warm, fuzzy feeling of being around a loved one of many years. You prefer jobs and tasks that you know inside-out and backwards. But you are also an inquisitive person. You aren't afraid to ask questions, and you have a real thirst for knowledge. There is nothing wrong with knowing what you like. But pushing yourself to be a little more adventurous may just reveal things about yourself that you never expected. Never be afraid to try something new. Food can always bring people together. But the way we eat that food can speak volumes about what sets us apart. Which type of eater are you, and were your results as spot on as mine? Let us know in the comments. Please SHARE to see what type of eater your friends and family members are!